Software Time Lock is a software program for Windows computers that allows you to control at what times the Internet, specific programs, and even Windows itself can be used on a particular computer. In addition, it can allow you to control how long these functions can be used in the course of a day. 1) Set blocks of time for each day of the week during which you cannot access the Internet on a computer. For example, you can set that you cannot access the Internet Monday through Friday from midnight to 6 PM and from 10 PM to midnight. You can set several blocks for each day, such as midnight to 8 AM and 6 PM to midnight, thus creating a limited time period during which the Internet can be accessed (in this case, 8 AM to 6 PM). 2) Select specific programs and set blocks of time for each day of the week during which you cannot use these programs. For example, you can set that you cannot use certain games from noon to 8:00 PM Monday through Friday. You can set several blocks for each day, such as midnight to 8 AM and 6 PM to midnight, thus creating a limited time period during which the programs can be used (in this case, 8 AM to 6 PM). 3) Set blocks of time for each day of the week during which you cannot use the computer at all. For example, you can set that you cannot have the computer on from 9 PM to midnight and from midnight to 8 AM on Saturday and Sunday. You can set several blocks for each day of the week, such as midnight to 8 AM and 6 PM to midnight, thus creating a limited time period during which the computer can be used (in this case, 8 AM to 6 PM). 4) Set that a user can only access the Internet for a specific length of time on each day of the week. For example, you could set that you can only access the Internet for one hour per day on Monday through Friday, and for three hours per day on Saturday and Sunday. 5) Select specific programs and set limits of how many hours and minutes you can access them each day of the week. 6) Set for each day of the week how many hours you can use the computer. If the number of hours is exceeded, a shutdown window will appear and Windows will shut down in ten seconds unless the password is entered. Software Time Lock is useful for parents to restrict how much time or when their children can use the computer, in order to protect your children. For example, they can use it to make sure that their children only access the Internet while the parents are home, or to set how many hours per day they can access the Internet. Software Time Lock is also useful in a business setting as a security function to prevent people from using the computer during hours when nobody is supposed to be in the office. Likewise, it can be useful in schools, libraries, and other places where computers are make available to people freely at some times, but not others. Note: The functions to limit the amount of time that the user can access the Internet, a program, or Windows (functions 4 through 6 above) do not fully function properly if the user does not have full read/write access. That is, Software Time Lock cannot properly control the amount of time a user has access if that user has a limited account. The functions to limit the times the users can access the computer (functions 1 through 3 above) will work with a limited account. Software Time Lock is available as shareware for $30 for one license, with volume discounts available. (For information on volume discounts, click here.). Try it for a month to see if you like it before you have to pay for it. Just download the install file to your computer, then run the file like a program by double-clicking on the install file in Windows Explorer or My Computer to install Software Time Lock. Remember that complete instructions are provided for uninstalling Software Time Lock if you decide that you do not like it. 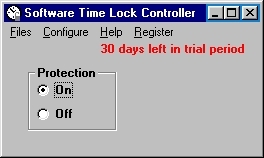 Software Time Lock runs on Windows 95/98/2000/XP/ME/NT. Click here to download the installation program (stlarc.exe). To see a review, click here. To see a virus report, click here.